← Nanoha Innocent got a sequel! That’s right. Two girls. Spending the day together. On Christmas Eve. The subtext writes itself. 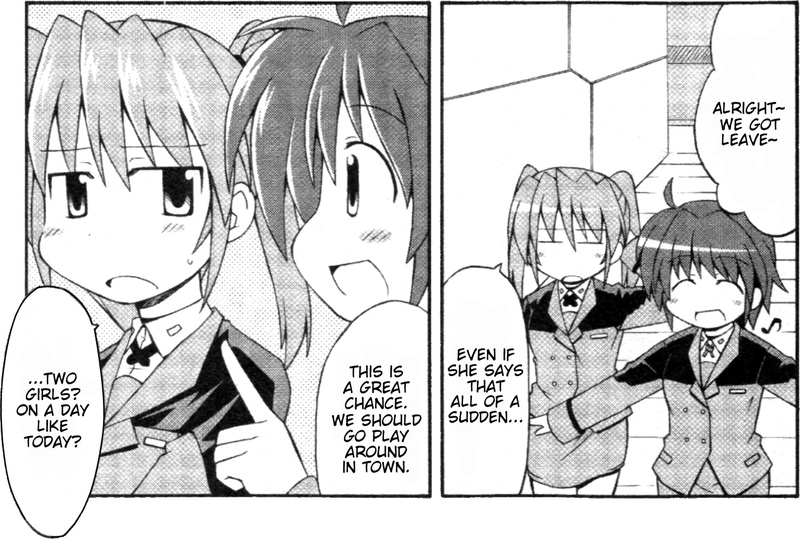 The fifth story in the Nanoha Anthology collection follows Teana and Subaru, still with Section Six, on another outing into the city. Only this time there’s no big battles about to happen. Just these two enjoying each others company. Well, mostly it’s just a reluctantly compliant Teana getting dragged around by the always cheery Subaru. Be prepared to make the age old comparison between rainbows and Subaru all over again. This is my first time doing the cleaning and typesetting all on my own. Well, with some tips and guidance from many of the more experienced artists we have in our circle. Just goes to show that you can learn this stuff if you want to. So if you’d like to help speed up our releases, please, drop us a line. This entry was posted in Comic Anthology, Releases, StrikerS era and tagged Nanoha, nanoha anthology, scanlation, subaru nakajima, teana lanster, ViVid Translations. Bookmark the permalink. Where Subaru and Teana are concerned, it’s really more like text.